LG Electronics has confirmed it will begin deliveries of curved OLED television sets next month, making it the first to offer such a product to the public. The 55i inch model will cost 15 million won (€10,775) and is initially limited to sales in South Korea. 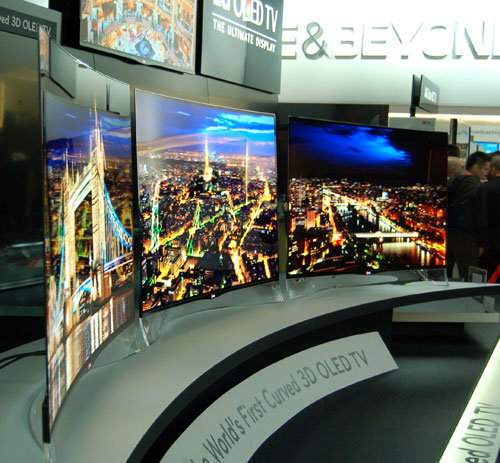 OLED technology is based on carbon-based materials that convert electricity into light. While LCD screens need a backlight to illuminate their crystals, OLED does not need a separate light source. This allows the newer type of TVs to be made thinner, lighter and more energy-efficient than before, as well as offering the advantage of deeper blacks. In addition, the OLEDs can be fabricated onto a flexible plastic substrate rather than a rigid glass layer, making it easier to manufacture them into a curved screen. This has allowed LG to market the new EA9800 model as being only 4.3mm (0.17in) thick, weighing 17kg (37.5lb) and offering an “Imax-cinema-like” viewing experience. “With more than five years research behind developing the optimum curvature, the entire screen surface is equidistant from the viewer’s eyes, eliminating the problem of screen-edge visual distortion and loss of detail,” the company said.